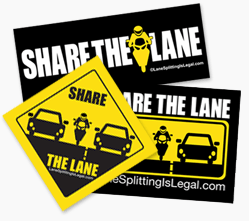 As the mission of LaneSplittingIsLegal.com involves from a PSA effort to help spread the word about the CHP lane splitting guidelines to becoming a resource on lane splitting in general, I’ll be working hard to get “exclusive stories” about lane splitting / lane sharing / filtering / whatever we’re calling it today. Since I work on this site in my “spare time” this can be tricky, but we have some good stuff coming up. First, I’m working on a writeup of the recent Nevada Assembly Transportation Committee hearing on AB236 – the Nevada lane splitting bill. This piece will be done shortly and will include video of the proceedings with testimony by several experts and supporting docs from the hearing. I’ve been reporting on this bill since it was first introduced and as far as I know, no publishers in the “mainstream moto press” are providing this level of coverage on what appears to be a lane splitting bill with a good chance of passing. Second, I’m working on an interview with the CHP’s Sergeant Mark Pope, Statewide Coordinator for the California Motorcyclists Safety Program and the mouthpiece for the CHP’s lane splitting guidelines. Sergeant Pope has been quoted in many articles and I’m super excited he’s taken some time out to answer a few questions for the site. Stay tuned – even more good stuff to come!